The fight against the Canadian invasion continues. We've had some luck in blocking the cold air fronts they've sent to prep for their assault, and our sources tell me that they're gathered up in Banff under the guise of vacationers but in reality are planning their next move. 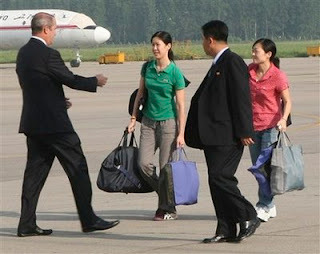 As evidence of former President Clinton's negotiating prowess, the North Koreans not only released the reporters, but also provided them with gift bags. Remaining true to form, Clinton made both women put their hand down his pants before they were allowed to board the plane. Meanwhile, upon the return from his successful trip, Clinton and his former Vice President Al Gore broke into their traditional celebratory tango. 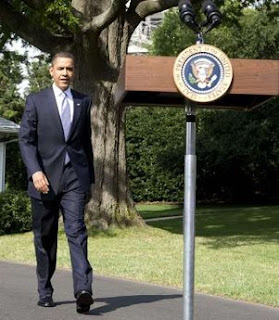 And finally, Republicans continued to try raise the ire of the unflappable President Obama - this time by raising his podium to an absurd height in advance of his press conference about the release. Okay, I need to get back into hiding. Stay strong!